ExpertED@SSO is an exclusive, free benefit of membership that gives you 24/7 access to more than 75 programs, including sessions from SSO’s Annual Cancer Symposium as well as articles from the Annals of Surgical Oncology and other leading industry research. This go-to educational site helps you stay up-to-date with surgical oncology science and practice. Log into ExpertED@SSO with our membership credentials or create an account to view an activity. Moderated by: Danny M. Takanishi, Jr., MD and Yanghee Woo, MD with guest speaker Rebecca Auer, MD, MSC. This webinar will help to increase knowledge of proficient scientific abstract formulation and the ability to practically apply this knowledge in the submission process for consideration by scientific symposia program committees. You may find this activity in the Other Surgical Oncology section in the ExpertED@SSO catalog. Should a Patient with a 2 cm HER2+/TNBC Clinically Node Negative Receive Neoadjuvant Therapy? Based on the SSO 2019 Great Debate, this webinar will present data and compare and contrast the benefits and limitations of upfront surgery and neoadjuvant therapy for TNBC and discuss resectable HER2+. You may find this activity in the Breast Disease section in the ExpertED@SSO catalog. This activity is partially supported by an independent educational grant from Genentech. Young Adult Onset Colorectal Cancer: What is going on? Young-onset colorectal cancer is distinct in many ways. Location of the tumor varies substantially with age and cancers are also histologically more aggressive. This webinar will review practice changing papers and national screening guidelines and age-related differences in colorectal cancer that have implications for diagnosis and treatment. You may find this activity in the Colorectal Disease section in the ExpertED@SSO catalog. Learn about the mechanisms of action and toxicities of novel immunotherapeutic agents for metastatic melanoma and how to best integrate these agents with surgical options. Four specific topics will be covered including: systemic therapy, immune adjuvants for Stage IV melanoma, management of oligometastatic disease and surgical outcomes in melanoma in combination with immunotherapy. You may find this activity in the Melanoma Disease section in the ExpertED@SSO catalog. This activity is partially supported by independent educational grants from Amgen, Bristol Myers Squibb and Merck. This series of five topics will cover minimally invasive approaches utilizing robotics for a variety of gastrointestinal procedures with video recordings and a live webcam Q&A and discussion with the faculty. You may find information about this series in the Gastrointestinal Disease Site section of the catalog. This series of activities is partially supported by Ethicon. Visit ExpertED@SSO to view this series. 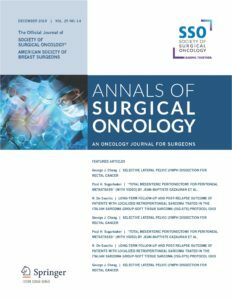 Earn CME credit by reading select articles from SSO’s Annals of Surgical Oncology. Articles are available on a variety of topics and are complementary to SSO members. Check out the newest article – Surgical Management of Primary Retroperitoneal Sarcomas: Rationale for Selective Organ Resection. Questions about completing a journal activity in ExpertED@SSO? If you weren’t able to attend a session of SSO 2019 or want to hear a session for a second time, you may login to ExpertED@SSO to purchase individual sessions or an entire program. Convenient mobile viewing is available on your iPad, iPhone or Android device.